In the 39 years since Cheng & Tsui dedicated ourselves to the mission of “Bringing Asia to the World,” both Asia and the world have witnessed dramatic transformations. Today, the dizzying pace of technological innovation, global political and economic uncertainty, and changes in the teaching and learning landscape mean that there are more demands on learners and educators than ever before. 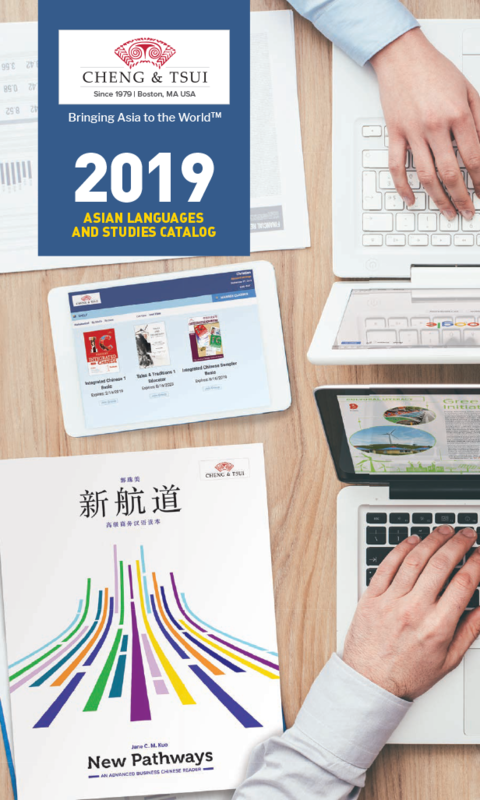 As a leading publisher of Asian language and culture materials, Cheng & Tsui is committed to helping you meet those challenges. In an increasingly digital environment, we seek to help students and educators learn and teach more effectively using new tools. To that end, the new 4th Edition of the acclaimed Integrated Chinese series shows students how to apply their language skills on social media and in other digital contexts. With the release of new auto-grading features on the innovative ChengTsui Web App™, we hope to reduce teachers’ workloads and create more rewarding digital learning experiences for students. In the face of growing global challenges, we aim to equip advanced-level learners with the knowledge they need to navigate the shifting political, social, and economic landscapes of Asia. With our recent advanced titles like New Pathways: An Advanced Business Chinese Reader and China’s Development and Dilemmas, we propel learners to higher levels of language proficiency and cultural competency, preparing them to grapple with nuanced issues in their chosen fields. As teaching methodologies change, Cheng & Tsui remains committed to supporting continuing education for teachers through professional development grants, special interest group awards, workshops, and practical pedagogical publications. We take pride in helping dedicated educators share their ideas and experiences beyond their individual networks. Lastly, we are indebted to each of you for providing us with honest feedback that enables us to improve. With your support, we’ll continue to publish new Chinese, Japanese, Korean, and Arabic materials that are effective in your classroom and relevant to language learners. To help us develop exciting future projects, please send your ideas to jillcheng@cheng-tsui.com. Thank you for all that you do to bring Asia to the world!